YouTube has truly exploded in the past few years and continues to take the world by storm. Like most social media platforms, its popularity is only increasing and with over 1 billion users (a third of all people online) it’s truly an appealing platform to post content. That aside, YouTube makes it fairly simple and provides a level playing field. All that is left for you to do is some sleek marketing. We have compiled this best golf YouTube channels review for your information and enjoyment. Let’s get stuck in. Hundreds of millions of YouTube videos are watched daily and are generating billions of views. Golf too isn’t left out of the fray and golf vloggers are on the rise. The content provided goes beyond PGA tours and is downright entertaining. From latest fashion, equipment, and course reviews to humor out of top golf misses, you are bound to get a kick out of most of these videos. So, here is our list of top golf YouTube channels. The list involves some established channels and some newcomers who are quite promising. If I missed a top channel, let me know in the comments below. The most subscribed golf channel with 520k+ subscribers (and nearly 1M across all their social channels) , Me and My Golf is definitely the best golf YouTube channel. This channel by Piers Ward and Andy Proudman focuses on core instructional training tips and drills alongside entertainment focused golf challenges and trick shots. The duo are tour professionals and their videos are not only informative but are also quite fun. 4 years ago they shot the ‘Golf Swing Made Simple’, which has gone on to be their most viewed video with 7.3M views. The duo shoots three series: the Impact Show, Challenge Tuesday which pits Andy against Piers, and My Swing Analysis Competition. The two are masters of golf with Piers having spent 15+ years helping golfers and Andy 11+ years coaching. Andy has worked with some of the best golf coaches thanks to his dedication to this beautiful game, and together, the two have shot 1050 videos as of this writing of an average 10 min length (on the higher end). They always have a new video or two up every other week. Why this channel is the best is partly thanks to their experience and amazing insight on golf. Well, there is a lot you can learn from Piers and Andy, but what I liked most was their swing instructional videos. In one lesson/episode, they have simplified the golf swing enough for newbies, and offer more on other videos. You will learn how to hit your driver dead straight, best golf swing to strike your irons pure, the perfect golf swing, and how to get backspin on the chip. They also have one of the largest online coaching websites in the world meandmygolf.com which has a userbase of over 40,000 people. From golf forums, most folks find this duos videos straightforward, creative, and well-founded. However, they can be a bit dorky and in an uncomfortable way. They also always dress the same and complete each other’s sentences. What’s up with that? By and large, the best, most-subscribed, and most-informative golf channel. With over 271k subscribers and coming second on our list of top golf YouTube channels, Mark Crossfield is a must watch for all golfers. He is a PGA coach at Clifton Hill Golf in Exeter UK and has done well over 3000 videos. 3177 as of this writing. Going by his sheer numbers, he is quite consistent and he produces several videos in a day and thus always be on the lookout for his videos. They range from 2 or 3 minutes to well over 20 minutes depending on what he is reviewing as he has no one specific specialty. However, expect more of golf tips and advice videos along with golf equipment reviews from bags, irons, and drivers. You might have come across his videos as he did one viral ‘How to Stop Slicing your Driver’ video 6 years ago which has garnered over 1.2M views. When it comes to Mark he is a master of several golf trades. If you are in search of course or product reviews, Mark is your guy. He also offers instructions on several golf issues such as slicing and driving consistency. In his videos, he also delves into golf tech (yes, this is different from equipment) and how it is going to affect your game. Mark is quite well informed in all matters golf and has a way of crafting complicated golf topics in modest ways that are easy to follow. He is also quite entertaining though he might be a bit difficult to understand given his accent. Some of his 1st videos were on the low end quality-wise, but he has since upgraded to HD videos. He might also seem to be quite repetitive seeing as he has been through most of the golf stuff in previous videos, but every now and then you might come across some interesting information. And if you are going to be a Mark Crossfield subscriber, you might as well get used to his "Let's get stuck in" "Alright, now let's give this one another wallop!!" sayings. If I was to explain Buzza golf in less than 10 words it would go something like this: Steve Buzza, the wedge master. From this channel, you stand to learn and hone your wedge craft. Steve offers tips and advice on how to improve your wedge play with realistic and well-reasoned strategies. With only 24k subscribers one might put him off as a mid-caliber YouTuber but his content is unsurpassed. Steve Buzza has been on YouTube for the last 6 years having launched his channel in Sep 2011. During those 6 years and as of this writing, he has produced 725 videos of an average 25 minutes. He is also quite consistent as he produces 2 to 3 videos a week. A golf professional and sports scientist, Steve Buzza is the guy to watch. He boasts some of the best wedge play tips and strategies. Other than his instructional videos, he does course vlogs and leaves you with fun challenges to advance your game. If that is not enough, he does stream his games and that is a sure way to learn new tricks. You can also catch up with him on his ‘In the bag’ series as he reviews some of the clubs tour pros are using. Going by what devout golfers have to say about Steve and reading up on forums, this is a must watch (subscribe) channel. Picking up golf at the tender age of 11, Rick Shiels has grown to be a renowned golf instructor. By the age of 21, he was a qualified tour professional but rather than play professionally, he opted to teach golf at the Mere Knutsford. He would later move to the Trafford Golf Centre in Manchester and started a YouTube channel in a bid to reach a larger audience. With a subscription of 498k+ and 147M+ total views, Rick Shiels golf is a must watch for golf enthusiasts. This channel follows an unorthodox approach to teaching golf tactics as there is no method or process to Rick's teaching. He goes to the player’s level instead of pushing the player to get to his level. He also provides his viewers with everything from swing lessons to equipment reviews and course reviews. One of his better-known videos is the ‘Iron Swing vs Driver Swing’ video which to date has garnered 634K views. As for his videos average length, they can be as short as 8 mins or as long as 1 hour. Either way, there is not a dull moment. For best equipment reviews, Rick is your guy. He always reviews the top irons released each year helping you make an informed decision. He also assesses different clubs, their capabilities, pros and cons which goes a long way when making a club purchase. However, there is more to the guy as he too does instructional videos. You will learn how to stop hitting the ground behind the ball, how to minimize slicing, and how to hit your driver straighter and longer. Rick is all business when it comes to golf and might seem a tad too serious compared to the likes of Mark Crossfield. You can also tell how much it irritates him when he makes a bad shot. However, he makes golf super simple and easy which is a plus if you are a beginner. His mid-handicap tester hitting clubs and giving feedback is pretty neat for the mid-handicap players. 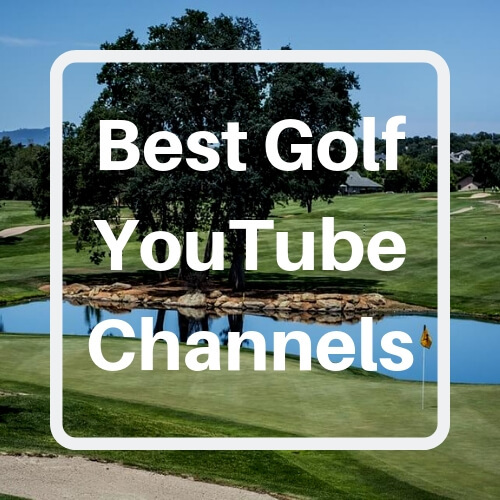 One of the top golf channels on YouTube, Peter Finch golf, had to make it onto this list of top golf YouTube channels. Finch’s first love was soccer but he picked an injury at the age of 13 which ended his young football career. He soon picked up golf and at 17 he started his PGA training. He would soon move to Trafford Golf Centre in Manchester where he would later follow in the footsteps of Rick Shiels and fellow coach to grow his client base through YouTube. Peter Finch provides free tips golf drills and advice on how to improve your game (more on this later). His philosophy is not to use any specified approach but to structure all lessons according to the player’s needs. His channel has over 174K followers and his videos have over 45M views. Also, expect a video every other day or two, and he has uploaded 992 videos since he launched his channel back in 2011. Peter Finch videos cover numerous topics. He has Tech Tuesday where he reviews golf tech in a way only he can, course vlogs, Finch Friday Q&A, Wellness Wednesday, Smash it Long and Quest for the Open. Thanks to his diversity, Peter Finch Golf is a must watch. Peter is a good coach. No, a great coach. Going by what his students have to say about him, his lessons are gold. One player has perfected his game from beginner to professional golfer in 7 years thanks to Pete’s coaching while another has moved from a 36 handicap to a 2 handicap. His advice on grip is excellent and you will be hitting draws consistently with Pete’s coaching. Next, on our list of top golf YouTube channels is Wisdom in Golf by Shawn Clement. From this channel, you stand to learn the importance of anatomy, neurology, physics, and sports analogies to improve your swings. He also has a rather nonconformist style to teaching. According to the golf industry, you are defective and need a fix; and according to Shawn, you are Pinocchio without the strings and all you need is the right task to light yourself up! Seeing as he has been in the trade for well over 30 years, you would expect an instructional guide on how to achieve the best golf results which he has, and is called "Wisdom in Golf Premium". He prides himself in his ability to tap into how one's brain and body is wired to open the immense possibilities to a new way of approaching golf. Having been launched in Nov 2006, Wisdom in Golf has got to be the granddaddy of golf YouTube channels. However, this channel has 777 videos with the best video/most popular being the ’Best Downswing Weight Shift’ with 663K+ views which I deem a must watch. He has 85k+ subscribers and has garnered over 37M views. He was also named the most popular teacher on YouTube from 2007 to 2012 before hipster vloggers started running things. Well on Wisdom in Golf, there are a number of things you stand to learn. To begin with, you can learn how to improve your golf swings without hurting yourself or follow up on the Swing Builder Series with Chantal that will assist you in bettering your performance. There are also lessons on how to get more distance and how to lower your score with the short game series. You will find video lessons for the lefties (Shawn breaks par from both sides), for the ladies and in French as well! Check out the play lists on his channel! If you are looking for a channel that’s humorous as well as informative, then you might want to try Fried Eggs Golf. The hosts are good both in front and behind the camera. Going by how good their content is, it is actually a surprise that these guys have only 27k+ subscribers. However, that is understandable as the channel was launched only 2 years ago. They have done a total of 181 videos at a frequency of 1 or 2 a week. The length of their videos is no more than 26 minutes. Their music video series is golden. They have a mashup of equipment reviews and music which is just quite funny. A pretty neat way to get information across. They also do course vlogs and a golf shop series that details how to spot counterfeit clubs and how guys pay double for a club just because it got the tech. This channel is an absolute classic. They incorporate a sense of humor that we don’t get in most golf channels. Their care-free yet informative videos are superb and I guarantee that you will love them. After 30 years of mediocre golf where he could not perfect his swing, Christo Garcia decided to study the free-flowing classic Ben Hogan swing, used by the greatest ball striker in the history of the game. After mastering it, he launched My Swing Evolution which is 8th on our list of top YouTube channels. Perhaps you have come across some of Garcia’s content if you have watched the ‘18 yr. old drives 400 yards’ video. This is his best video having been viewed 1.7M times. The channel itself has had 18M+ views of its 726 videos. My Swing Evolution was launched back in 2011 and has 38K+ subscribers. As for the frequency, expect at least one video every other week. Inspired by decades of mediocre golf, My Swing Evolution features a comprehensive examination of the vintage golf swing that Ben Hogan is renowned for. Some of the basics you will pick up are the Hogan roll, squeeze pivot, the push’/pull, the hip/slide etc. Well, it is a process before you get that classic golf swing. By reading up on what’s on golf forums, one gathers that this is an intuitive and well-thought-out channel. It is the closest you will get to grasping Ben Hogan’s swing. However, it lacks transition information as Garcia does not advice on how to make the tips he offers part of your own swing which will be a daunting task. Nonetheless, this is an incredible channel. Next on our list of top golf YouTube channels is Chris Ryan Golf channel. Chris Ryan could be eligible for King of YouTube in the golf category thanks to his educational, factual, and informative videos. A senior PGA national academy instructor at the HIT Golf Academy at The Forest of Arden, Chris is quite experienced in golf tutoring. Some players have gone from a 10 handicap to a 5 thanks to his videos. That aside, this channel has 121K+ subscribers and 443 videos which is quite respectable for a channel that began in 2011. His videos of an average 6-minute length have garnered more than 25M views. He is quite consistent with his releases although there are instances he has been away for months on end. However, this is the exception rather than the rule. You can expect 2 to 4 videos a week on most occasions. For an advanced player, his instructional videos can be a put-off and you might be better off watching Seb on Golf. Nonetheless, for beginners, there is a lot you can learn from Chris. Some of his lessons include downswing and backswing instructions together with driver instruction as well as impact instruction. His proficiency as a golf instructor makes this a must watch channel. Beginners are at an advantage as his content is quite straightforward. Players have dropped their handicap thanks to Ryan’s instructional videos. Despite being inconsistent with his videos doing only 1 or 2 a month to going months on end without new content, Seb has managed to attract 100k+ subscribers and over 200,000 across all social media platforms. He is one of the better golf YouTubers and his channel had to be on this list of top golf YouTube channels. Seb’s outlook on golf is remarkable, to say the least, and will have you hooked from the get-go. Since its inception back in 2016, Seb on Golf has only aired 30 videos. However, the channel has managed to garner well over 2.04M+ views. His most popular video is the ‘Hashtag United Golf Tournament’ with 307k views. Seb’s episodes are an average 11 minutes but some can stretch to 30+ minutes. Despite the few episodes and the inconsistency, Sebs entertaining challenges and course vlogs make for good videos to watch. He also has appearances from other YouTubers and sportsmen. He is also an avid soccer fan and his videos more often than not will bring coalesce sports. A little more about Seb is that he is working on his own game and trying to get back the form that saw him as the only person ever to win the Grand World Final of the Trilby Tour twice in 2013 and 2015. He is a low single digit golfer who makes content about his worldwide travels and also features some of Golfs biggest names along the way, such as Sergio Garcia and many BIG names from the world of football/soccer also! There is not much to learn from Seb, but that is the beauty of his channel. His videos are structured to bring out the beauty of golf. For that reason, if you are in search of instructional videos, then Seb on Golf is not the channel for you. However, to truly appreciate the splendor of golf, this is the channel for you. Seb is the future of this game. His approach to golf is attracting new players to the game and growing it. I wouldn’t pick any one of these channels over the other as they are all incredibly good golf YouTube channels. However, going by their consistency and relevance, we came up with this list of what we consider to be the best channels. Some offer good instructional videos, others focus on golf equipment reviews while the rest are all about fun. That’s it from us. Tell us which channel you think is the best, and if we missed some big ones, let us know.